One on One with legendary drummer Carl Palmer – CARL PALMER’S ELP LEGACY- EMERSON LAKE & PALMER LIVES ON! All In Music Review had a chance to talk with legendary drummer Carl Palmer, founding member of 70’s progressive supergroup Emerson, Lake and Palmer as well as 80’s Progressive rock group Asia where we discussed the current Tour, CARL PALMER’S ELP LEGACY- EMERSON LAKE & PALMER LIVES ON! Since he began in the music business in the 1960s Carl Palmer has sold over 50 million records and was voted by ROLLING STONE as one of the 10 Greatest Drummers of All Time. Since 2001, Carl has fronted a 3 piece power trio: guitar, bass & drums doing the classically driven rock hits of ELP with NO KEYBOARDS. All In Music Review: Mr. Palmer, thank you for taking the time from your busy day to talk with us today. Carl Palmer: Good morning, I’m ready for your interview. All In Music Review: I’d like to start off with the tour, can you tell me a little about the shows and how the tour is going? The music that you are performing as well as the ELP music released on BMG. Carl Palmer: Let me talk you through the show. The show is roughly 1 hour fifty minutes, maybe 2 hours. We have a cinematic approach to the whole show. We have a screen that we have on stage where we play various strips of footage which relates directly to the music that we are playing at the point in time. We are playing things like “Tarkus”, the full version, which was a big Emerson, Lake and Palmer concept piece of music. We are playing “Knife Edge,” “Hoedown” by Aaron Copeland as well as “Trilogy” which was a leading studio album for ELP. In the group, we have Paul Bielatowicz on lead guitar and Simon Fitzpatrick on Chapman Stick and on bass guitar. They both have various features during the show. Simon’s feature, believe it or not, is on a very well-known track by ELP called “From the Beginning” which was a top 20—top 10 hit here in America many years ago. Basically, I’m flying the flag for ELP as always but I’m presenting the music to a new generation of listeners because this music we are playing today wasn’t ELP music, it doesn’t have keyboards, we are just a guitar group, a guitar power trio. Fortunately enough the standard of musicianship today is so incredibly high I can afford to do it this way and its working incredibly well. There seems to be no reason to recreate exactly what Emerson, Lake, and Palmer did. What was the main object here was to bring it to a new generation (of fans) between the ages of 30-40 and their sons so we are actually hitting three generations of fans at our concerts, the guys my age, their sons and the sons of their sons. What we have also done for this tour is released an album with a DVD. It was a live recorded album of Carl Palmer’s Legacy (CPL), a live album and a DVD that was recorded roughly 18 months ago in Florida as a dedication to Keith Emerson and because Greg Lake passed away in the same year we flipped it around and it was a dedication to both Keith and Greg. On this DVD we are looking at things like, the IDA Program Children’s Choir join me on stage and sing that classic piece “Jerusalem” which was a single which was banned in England by the BBC many years ago because it’s a church hymn really and they didn’t think it belonged on the stage of rock and roll as they say. We also had Steve Hackett from Genesis join us that night. He played some lead guitar and some harmonica on a couple of tracks “Fanfare for the Common Man” by the great American composer Aaron Copeland, singing that night on “Welcome Back Friends” and “Knife Edge”, two classics of ELP was Mark Stein from Vanilla Fudge. That is out now on BMG, the main label for ELP. The box set that came out in June of this year, also on BMG, sold out in no time at all. This box set, which we started to put together when Greg and Keith were alive, unfortunately, they never got to see it, so I finished off the production of that with BMG. We only printed up or made up 3,000 sets. In each unit, there were vinyl records, some CD’s of some live concerts which had never been released before, plus a coffee table book as it were and many, sort of, photos of the band and an ELP badge in there. It was a beautiful box set with the vinyl, the DVD’s, CD’s and unreleased material and it worked remarkably well to the point where it sold-out in a matter of months. What followed that was a live album, Carl Palmer Live with another DVD made as a tribute to Keith and Greg which is part and parcel of the DVD/CD package and that’s where we are to date. All In Music Review: In watching a number of older videos it struck me how complex the ELP music is. Transcribing the music to the guitar-based lead seems very difficult and very challenging, correct? Carl Palmer: Yes, what happened is the band that I’m running now started in 2001 and to find out if we could actually transfer the keyboard parts to a guitar obviously took a long time to do and to work it out to see what could and what couldn’t be played. There is obviously certain things that you lose, certain harmonics, harmonies rather, and certain things you gain as a different level of excitement for example. I went to a specialist who does nothing but look at piano parts and try to transcribe them to a guitar. I did this in the very beginning, with a specialist in London and we came up with various things that could and couldn’t be done. Nevertheless, over the period of time, from 2001, the standard of playing has improved, improved, improved on guitar, so much so… I mean you hear more about guitar players than you do about keyboard players these days. There are more guitar players who are able to get their fingers around these parts. To be completely honest with you, in the band we actually have a 6-string bass guitarist which is Simon Fitzpatrick who also plays the Chapman Stick. The Chapman Stick is a 10-string instrument and with this instrument we can play chords and the root note at the same time which means you can have a walking bass line and the triad chords on top of that and then you have the lead guitarist on top of that and then the drums so we can sound quite big as a power trio. The Chapman stick, which has been invented in the last, I don’t know how long exactly, 10-15 years, has played a vital part in producing some of the Emerson, Lake and Palmer sounds. If we wanted to produce them exactly, we can with the Chapman stick. For example, the iconic solo at the end of “Lucky Man” can be produced note for note if we want to do that. This was never my exercise, this was never my aim but sometimes what we did then was the best and only way to do it, so we do introduce that into what we play. But really the game here was to bring in (the music of ELP) to a new generation by using guitar players and we have definitely succeeded in doing that. We played here in New York last night and we are here again tonight, and we are selling out! So you know, people want this music. They know how rich it is, how deep it runs and they know how interesting it is so it will live a long time, that’s for sure! It’s been played by classical orchestras, it’s been played by Jazz groups, I’m just playing it now with a power guitar trio! All In Music Review: All of this is outstanding! I can tell you we are excited to catch your tour stop in Louisville this Thursday. Carl Palmer: We are looking forward to playing in Louisville, believe me. It’s always great excitement to get that far down. All In Music Review: Thank You so much for your time this afternoon. 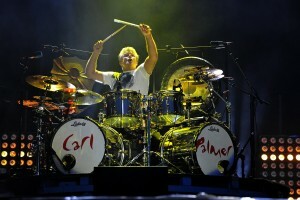 Carl Palmer: Thank You so much for the interview, I do appreciate your time! To follow all things associated with Carl Palmer and Carl Palmer’s ELP Legacy and be sure to check out his website at www.CarlPalmer.com or by following the links below. 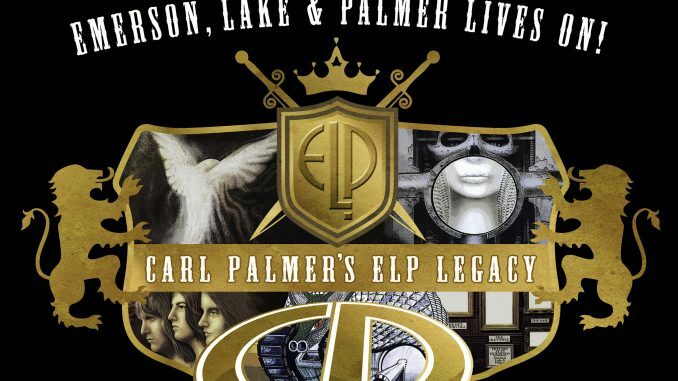 CARL PALMER’S ELP LEGACY- EMERSON LAKE & PALMER LIVES ON!